Weekend Recap: Hotties, Kites, and Too Much Dancing! I had quite the eventful weekend! Saturday, we took Mikey to the vet to be checked for heartworms. Luckily, we are heartworm free, so we started some preventative. After that, mom and I headed to Fayetteville. We had lunch at Chipotle (yummmm! ), and did a little shopping around downtown, and then we saw Mary Poppins the musical! It was such a fun show! Afterwards, we stopped in at a few shops downtown (Riffraff and the Mustache) and we got some fun shirts. I got a t-shirt that says “I speak Arkansaw” I just love it! Then we headed back home. When we got home, Tyler took mom for a ride in the Mustang, and then she headed back to Hot Springs. Tyler and I had plans to take the lawn mower to mom and dad’s lot for him to mow the grass, and then we would get some dinner. Well, Tyler mowed and we both just wanted to go home…so we had dinner at home. Nothing like frozen pizza and popcorn shrimp! ha! Gourmet cooking at its finest! 🙂 I went to sleep early in preparation for Sunday…. 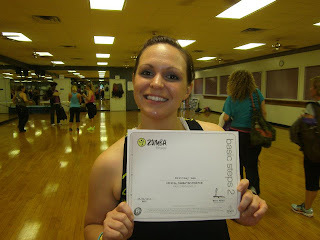 Sunday, bright and early, I met 3 other local Zumba ladies and we went to a Zumba Basics 2 training. 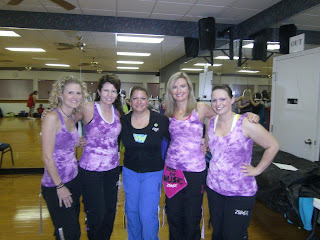 The 4 River Valley ladies (in matching tie dyed shirts!) with our Zumba Education Specialist Priscilla! This was an all day training where we learned 6 rhythms (flamenco, tango, samba, belly dance, soca and quebradita). We orginally learned 4 rhythms at our first training (salsa, cumbia, merengue, and reggaeton). We danced ALL day. Learning 6 rhythms on top of teaching tips and class tips is tough work. I was so ravenously hungry when we were finished. We all ate way too much at La Huerta afterwards. It was a fun day, though. I learned some new fun stuff for Zumba and I am so glad I went! Today I am feeling tired and kinda sore, but I REFUSE to have a bad attitude. I will enjoy work today and then get to walk a little at the park (hopefully) after work to help these sore muscles relax. It was such a busy weekend, that it kinda felt like much more than 2 days….but it was fun!